No one likes to be in debt. Yet debt often allows people to raise their living standards and increase their productive capacities. Debt entails risks and future obligations, but can also provide a means of generating future income. Everyone, at some time or another, has seen the disastrous consequences of excessive accumulation of debt by a person or business. Conversely, growth and prosperity have flourished at times when overall indebtedness was rising rapidly, and some economic slowdowns have coincided with periods of debt reduction. Thus, debt appears to be both good and bad — a paradox that has challenged philosophers for centuries. 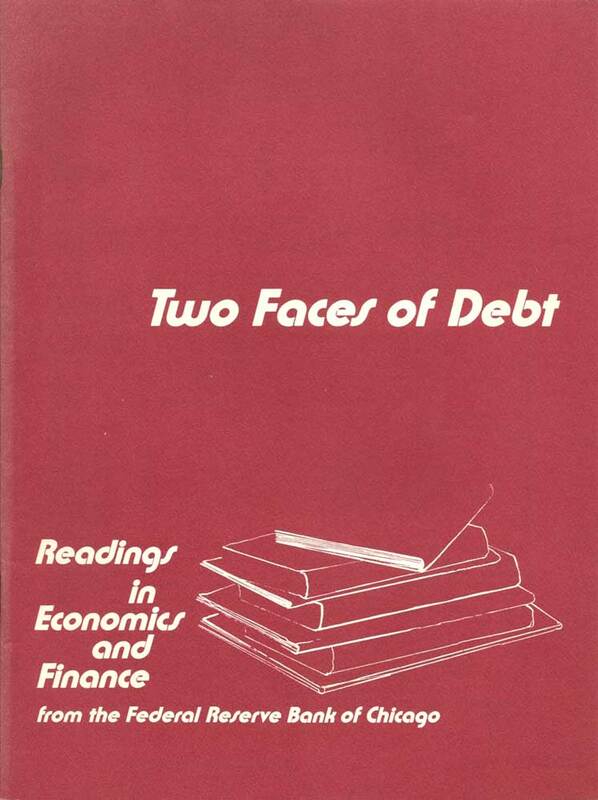 This booklet examines debt in the American economy and the composition and distribution of debt between major groups of debtors and creditors. While the review points out some risks that can be associated with an over-reliance on debt, it shows the vital role debt can play in channeling savings into productive investment. People who borrow are often looked upon as lacking thrift and a sense of responsibility. But people with good credit ratings are viewed with respect — often even with envy. Yet, the transaction is the same — to obtain credit is to incur debt. Recognizing this identity is the first step toward understanding debt and its function in our economy. The next step is recognizing the different forms of debt. And the final step is understanding the uses of debt. Everyone knows what debt is when he or she owes it, but people sometimes forget that most of the financial assets they try to accumulate are the debts of others. A brief summary of the things that make up the total debt of the economy calls attention to some of the less familiar forms of debt and suggests the relationship between debt and economic activity. The principal forms of debt are shown in the following table, grouped according to the economic sectors owing them. The types of debt owed by each sector reflect differences in both borrowers' credit needs and conditions under which lenders are willing to supply funds. One important difference in debts is their maturity — the length of time before the debt must be repaid. This varies from “on demand” to several decades. Other characteristics that vary with the types of debt are the collateral a borrower offers, if any, the contractual arrangement for payment of interest and principal, and the negotiability of the debt instrument itself. There are also other types of claims that have some of the characteristics of debt. A business needing funds, for example, can obtain them either by issuing shares of stock or by borrowing. Both the purchaser of the stock and the lender are suppliers of funds. But a stock certificate represents an ownership interest (equity), while the notes and bonds are a form of debt. Both are claims against the income and assets of the business, but under our legal system, the debt has a prior claim, providing protection to creditors (lenders) and limiting their risk, both up and down, while owners (stockholders) share all the risks of success or failure. The concept of debt used here includes the money-type liabilities of the government and financial institutions — currency, deposits, and share accounts. These instruments differ from other debt in some respects. Some, for example, are used in everyday transactions. However, their inclusion is appropriate for the purpose here — to present a comprehensive view of all financial claims that all units of all sectors can be called upon to meet, either on demand or in accordance with contractual agreements. Most people are familiar with home mortgages, installment contracts, charge accounts, personal loans, and credit cards. Some kinds of debt, like home mortgages, are typically long-lived, with repayment schedules that span most of a person's active working years. Others, like charge accounts, are meant to fall due so soon that the use of credit instead of cash involves little more than convenience. Credit … is the only enduring testimony to man's confidence in man. Credit is a system whereby a person who can’t pay gets another person who can’t pay to guarantee that he can pay. People differ in the extent to which they use credit. Some seldom borrow, while others use credit any time they make a large purchase. An important reason for the widespread use of consumer installment and mortgage credit is that a family’s needs usually peak while the family’s income is still relatively low. Essentially, young families are able and willing to borrow because they expect higher income in the future. Thus, by using credit, they can obtain the use of expensive goods (homes, cars, appliances) rather than renting them or first saving all the funds required to purchase them. Additionally, the use of credit may facilitate the purchase of a good or service (education, for example) that will enhance future income and the ability to pay off the debt. unless they don’t need it. The point is that indebtedness may increase, not because borrowers live beyond their means, but because they would rather borrow than give up earning assets for purchases that cannot be paid for completely from current income. Entrepreneurs and managers are probably more aware of debt than consumers, because most businesses make use of credit in one form or another. Debts of businesses include bonds, notes, and commercial paper issued by corporations, mortgages on land and buildings, other bank loans, and trade payables. Companies, like individuals, often go into debt to buy long-lived goods. Some business assets, such as factories and office buildings, are so costly that many companies would lose years of profits if they waited until they could save enough to buy them outright. Business investment in such assets is particularly important because it is a key ingredient of growth, both for the firm and the economy in general. Businesses also borrow a great deal of money for short periods. Much of this short-term credit is used to fill gaps between the time businesses pay production expenses and the time they receive payment for sales of their products. A farmer, for example, who borrows to buy feeder cattle typically repays the debt months later, after the fattened livestock are shipped to market. Likewise, a retailer will borrow to purchase inventory knowing that it may take weeks or months to sell the inventory, and even longer to receive payment from customers. The motivation behind business decisions to go into debt is the desire to earn profits. Business people will willingly add to their debts only if they expect the extra income earned through the use of borrowed funds to more than cover the total borrowing costs. Whether businesses borrow to finance specific expenditures or to provide working capital, the deciding factor is the prospect for increased earnings. With governments, borrowing is a different proposition. Governments, whether federal, state, or local, largely determine their own incomes — through their power to tax. And unlike private businesses, governments do not borrow and spend to generate profits, but rather to provide public services. Most borrowing by the federal government is used to bridge gaps between tax collections and total expenditures, rather than to finance specific services or projects. State and local governments often borrow to finance construction of specific projects (highways, schools, bridges, etc.) that would be difficult to pay for out of current income. Among the federal government's debt obligations are the familiar savings bonds — issued with relatively long maturities but redeemable on demand — and many marketable securities maturing in periods generally ranging from a few weeks to 30 years. The Treasury also issues special nonmarketable securities to some of its own agencies and trust funds, to state and local governments, and to foreign governments and central banks. Government-sponsored agencies also issue debt to support home financing, student loans, and other purposes. In addition to issuing securities, the federal government, through the Federal Reserve System, issues noninterest-bearing debt — currency or paper money. Currency is so widely accepted as a medium of exchange that most people do not think of it as a debt. Technically, however, Federal Reserve notes are liabilities. Also, all governments “owe” the reserves held in their various retirement and insurance funds. Financial institutions may also be considered debtors. The major types of organizations in this category are depository institutions (commercial and savings banks, savings and loans, and credit unions), life insurance companies, finance companies, money market and other mutual funds, and pension funds. Apart from the role of depository institutions in providing checking account services, these organizations act largely as intermediaries — accepting funds from savers and lending them to borrowers. While most depositors probably never think of their deposits in banks as bankers’ debts, one can be sure that bankers do. Banks in effect “borrow” deposits from their customers with the promise to return them either on demand or after a specified period. Likewise, savings and loan associations, life insurance companies and other financial institutions receive funds from their share-owners and policyholders with the promise to return them on request or under fixed contractual conditions. Generally, a financial institution “goes into debt” at the initiative of its creditors (customers whose accounts it holds). But when commercial banks and savings institutions issue certificates of deposit, which have fixed maturities, they “borrow” deposit funds in much the same way other corporations acquire funds through the sale of securities. Financial institutions pay interest on certain types of liabilities, such as time deposits and insurance reserves. Since the early 1980s, depository institutions have been able to pay interest on some checking accounts, although they still cannot pay interest on demand deposits. As international trade has expanded, businesses and governments in other countries have become increasingly indebted to institutions in this country. A portion of the debt owed by foreign entities is incurred because of trade activities. The balance primarily represents long-term investment abroad. Funds are obtained through the issuance of bonds and commercial paper, through loans from banks and other lenders, or through direct investment abroad by domestic businesses. While debt is a claim on the assets and earnings of those in debt, it is also part of the assets of their creditors. Just as there must be a buyer for every seller, for every debt incurred there is someone else who acquires a financial asset of equal amount. For example, a debt such as a savings bond, a deposit account, or a corporate bond is as much an asset to the owner as a stock certificate or title to real estate. In the case of commercial banks and most other financial institutions, almost all assets consist of debt instruments — promissory notes, bonds, and mortgages — evidencing that some business, government, or person has borrowed from them. In fact, many of these institutions are prohibited from investing in equities in any sizable amount. Why are most people willing to hold the debts of others as assets? Or more to the point, why and how do we save? People choose to hold currency and checking accounts to facilitate spending. But they are reluctant to hold more than needed for transactions because currency and some checking accounts are nonearning assets while those checking accounts that are interest-bearing typically earn less than other debt assets. These other types of debt offer a convenient way of storing savings (funds that are not needed for immediate spending) while earning returns in the form of interest. The many forms of debt owed by different types of borrowers provide a wide choice of outlets for funds that can be loaned. Lenders make their selections based on the types of financial assets that best suit their needs and, to a large extent, that reflect the length of time they are willing to forego use of their funds and the degree of risk they are willing to accept. A lender who plans to use the funds for a vacation cruise within a year, for example, is more likely to purchase an asset such as a short-term Treasury bill or a certificate of deposit maturing within a year than to lend the funds for a 30-year mortgage. A longer-term debt asset might be acceptable, however, if it is one that can be sold easily, enabling the holder to get cash for the asset, if needed, before the maturity date. But, it is important to recognize that the price at which a long-term security could be sold might be considerably above or below the initial purchase price, introducing an added element of risk to the lender's investment. The ease of converting an asset into cash without loss is referred to as its liquidity. In addition to differing in terms of maturity and liquidity, debts differ in their risk of default and in the extent to which they are secured by collateral — i.e., assets pledged by a borrower that the lender would acquire in the case of nonpayment. Lenders will tend to assume greater risks for higher rates of interest. Generally, the smaller the risk of nonpayment, the greater the collateral, and/or the greater the liquidity of the debt, the lower the interest rate. This reflects the premium savers place on keeping their funds safe, liquid, and conveniently available. Borrowers compete for the use of funds by offering financial instruments with different terms (interest rates, security, and schedules of payment) and maturities (length of payment period) that may be attractive to lenders. Although the number and types of debt instruments have expanded rapidly in recent years, the financing options to different types of borrowers vary greatly. While a corporation may be in a position to decide whether to sell long-term bonds, borrow from banks on a series of short-term notes, or issue commercial paper, most home buyers do not have as wide a choice. Generally, they must obtain mortgage loans. If mortgage terms are more stringent than desired, a buyer may not be able to obtain as much credit as he or she wants and may have to accept a relatively short-term loan with higher payments than expected. However, the increasing number of mortgage options available (shorter maturities, balloon payments, adjustable mortgage rates, prepaid points) has made mortgage financing more accessible. Still, if none of these alternatives are viable, the consumer may have to consider renting instead. Although most borrowers have some choice in the terms they offer lenders for the use of funds, the federal government is unique in its appeal to the whole range of lenders. Because of the huge volume of its borrowing, the ease with which its debt can be traded, and its superior credit rating, the government can exercise considerable choice in the terms it offers and accepts. 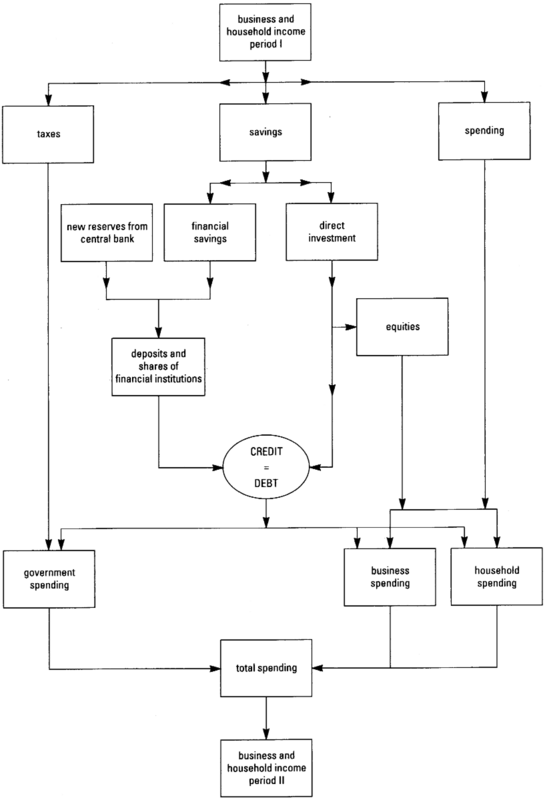 A major task of public debt management is tailoring government securities to fit the needs of all types of lenders — individuals, depository institutions, pension and trust funds, and businesses — that have funds available for different periods and have different earning and liquidity requirements. Given its ability to offer attractive terms to all lenders, the federal government plays a particularly significant role in the debt market vis-à-vis the other borrowers with which it competes. Like any borrower, when the federal government enters the debt market to obtain new credit, the increased demand has the potential to raise the price of credit, i.e., the general level of interest rates. Because the federal government is generally willing to pay whatever rate is necessary to attract the funds it needs, and because its debt is very safe and liquid, lenders typically meet the government's needs or demand for credit. Other borrowers, however, generally must offer even more attractive terms if they want to attract credit. When borrowing by government comprises only a small portion of the total new debt desired, its impact on interest rates is generally small. However, as the governmental portion of total borrowing increases, the potential impact on interest rates also increases, and private borrowers are forced to offer even higher rates if they wish to obtain credit. Concerns have sometimes been raised that a large volume of federal borrowing “crowds out” other borrowing because private borrowers are unable to offer terms attractive enough to obtain all the credit they desire. While government debt can be attractive to all lenders, debts of the major types of financial institutions — especially commercial banks and savings institutions — are particularly well suited to the requirements of small savers. These institutions generally stand ready to repay funds left with them, in exact dollar amounts and immediately upon request. To be able to meet such demands, they must invest part of their funds in assets that can be readily sold at fairly stable prices. This usually means high-grade debt obligations of individuals, governments, and businesses. While prudent investment policies provide the prime safeguard for funds entrusted to these institutions, further protection is given by distributing loans and investments over a wide range of borrowers and maintaining an equity cushion in the form of capital and reserves for use in absorbing losses on any debt defaults. Furthermore, because of the vital function these institutions perform as custodians of the public's money and savings, they are subject to supervision and support by various regulatory agencies, including the Federal Reserve. Regulatory supervision of operations helps to ensure that depository institutions operate safely and soundly. In addition, some government agencies insure a large part of the deposit and share liabilities of these institutions. Insurance and guarantee programs are also provided for some types of loans that these and other financial institutions make. The ability to borrow from Federal Reserve banks and Federal Home Loan banks can also be of great importance to many depository institutions because it can provide a needed cushion during times of financial duress. The following chart shows the distribution of debt among major sectors of our domestic economy and their net interaction with foreign borrowers and investors. The units within each sector that owe and own debt are not identical, but many businesses and individuals are included in both groups. A business, for example, often borrows to grant credit to customers. Most people wear two hats — one as owners and another as owers of debt. Anyone with a mortgage on his or her home and possessing a savings account or savings bond occupies such a dual position. Although many consider going into debt the antithesis of thrift, without debt many of the thrifty — and especially small savers — would be hard pressed to find profitable outlets for their savings. Moreover, unless these funds were spent by somebody, future income and savings would tend to decline. A basic axiom of economics is that each dollar spent by one person is a dollar of income for another. Any amount of unused, unspent income (savings not invested) must ultimately reduce future income by at least that amount, and probably more since money changes hands many times while in the economy. In addition, debt traditionally provides the capital needed for long-term growth. Through prudent use of debt, firms, individuals and governments can reap the benefits of technological and infra-structure improvements, without first having to save the funds or raise taxes significantly in a single year. Total debt owed must equal total debt owned, but this equality does not apply for any individual or group. Some individuals and businesses owe more than others owe them, while in other cases, debt assets owned are larger than debts owed. The gross and net debt positions of the five major sectors of the economy are shown in the following 5 charts. These “debt balance sheets” show the estimated amounts of debt owned and owed by each sector. These outstanding debts are arranged in subgroups indicating the sector from which debt assets or liabilities originated. This cross-classification by debtor-creditor group and the net debt position of each group are summarized in the following table. All claims on government are in the form of debt because most public bodies cannot raise funds by issuing shares of stock. Governments, unlike individuals and businesses, have no choice but to borrow to bridge the gap between current receipts and expenditures because they do not (and, because of statutory limitations, generally cannot) save in anticipation of future requirements. Despite their net debtor position, government units usually have favorable credit ratings. Interest rates on Treasury securities are lower than on private debt, evidencing investor confidence in the federal government's ability to pay debts as they come due. The low interest rates on debts issued by state and local governments reflect the exempt status of interest on these securities with respect to federal, and often state, income tax. By far, the largest net creditor group is the household sector. In the mid-1980s, the rest of the world moved from a net debtor to a net creditor position, but still accounts for only a very small portion of the total net credit supplied in the U.S. economy. Reflecting their role as financial intermediaries between savers and borrowers, banks and other financial institutions both own and owe a huge volume of debt and occupy a slight net debtor position. Commercial banks have been an important element in the economic life of most western countries for centuries. Over the past 50 years, savings institutions (savings and loans, savings banks, and credit unions) have also become an important part of the financial sector. And pension funds, which have benefited from the widespread adoption of pension plans and increased contributions by employers and employees, offer further opportunities to accumulate savings. Overall, the liabilities of financial institutions (which are assets to the account holders) have risen dramatically. Notes: Estimates based on Federal Reserve Flow of Funds data for year-end, 1990. Nonprofit institutions and personal trusts are included with households. Only non-financial businesses are included in businesses. The Federal Reserve, federally sponsored credit agencies, federally-related mortgage pools, and state and local government employee retirement funds are included with governments. Financial institutions here include depository institutions (commercial banks, savings and loan associations, savings banks, credit unions), finance companies, money market and other mutual funds, real estate investment trusts, securities brokers and dealers, and issuers of securitized credit obligations. Rest of world includes debt owed to and provided by U.S. holders only. Households — the economy’s largest lender group — own well over one-third of the total debt assets outstanding. Much of the household-owned debt is highly liquid, being in the form of currency, checking and savings accounts at banks and savings institutions, and shares in money market mutual funds. Another significant portion is held in reserves in pension and insurance funds. Most household obligations, however, are fixed, long-term debts — principally residential mortgages. The strong net creditor position of households is reflected in their net worth, which also encompasses a huge aggregate of fixed assets and durable goods. Businesses — taken as a group — are net debtors, that is, they owe more debt than they own. Besides trade payables (one type of debt businesses owe each other), their largest liabilities consist of long-term bonds and mortgages on business property — which includes farms, offices, and apartment buildings. Most business debts are owed to financial institutions. Payments due from households and other businesses for goods and services make up about one-third of the debt businesses own. Another third is in the form of deposits, insurance receivables, and other liabilities of financial institutions. Unlike household assets, business assets are not usually in the form of money claims. Rather, they are in fixed assets such as plant, equipment and inventory. These are balanced in part by debt, but also by owner equity. Governments — like businesses — had liabilities outstanding at the end of 1990 that exceeded debt claims on other sectors by a substantial margin. The federal debt dwarfs state and local debts, but includes large amounts of federal obligations held by federal agencies, Federal Reserve banks, and state and local government units. Aside from these intra-governmental items, the biggest share of federal debt (including currency and savings bonds) is held by households. One reason governments have a heavy debtor position is that claims on them are almost entirely in the form of debt — virtually none is in equity. Balancing this debt on the asset side is public property and many intangible assets classed broadly under the general welfare, but most important, the authority to levy taxes. Financial institutions — unlike the other major sectors — hold relatively few assets that are not financial claims on others. Also, their liabilities are very large compared with their net worth. Their unique position as intermediaries between savers and users of funds is shown in the balance sheet. More than two-thirds of their liabilities are to households, but they also hold the working balances of businesses and governments. The funds these institutions “borrow” are fairly evenly distributed in credit extended to the household, business, and government sectors. Because profits of financial institutions are derived largely from their credit services, they try to keep as fully invested as possible in the debt assets of others. The rest of the world — with the expansion of international commerce — has liabilities to the domestic economy that have increased significantly in recent decades. As international trade has grown, so too has the use of debt to finance that activity and the investment needed to support it. Almost two-thirds of the debt owed by foreign entities is owed to the business sector, primarily for business investment abroad, with the balance largely related to trade activities. Of the domestic debt owned by the rest of the world, government securities represent about one-third. A much larger portion is owed by domestic firms, again reflecting the globalization of business and business finance. Debt in the Rest of the World — Balance Sheet with the U.S.
Total U.S. Debt Assets 1,399 1,059 Total Liabilities to U.S. The continuing production of more and better goods and services is characteristic of an expanding economy. A great amount of investment in new equipment and facilities is required for this expansion. People also invest when they purchase houses and other durable goods, and governments invest on behalf of the public in such facilities as highways, water systems, and schools. The funds for this new investment come mainly from savings. Sometimes the saver and investor are the same — as when a person uses his or her savings to pay for construction of a house or a company finances plant and equipment with retained earnings. Often, however, businesses and individuals buying long-lived goods use credit to cover at least part of their purchases. Because the accumulation of personal savings and the expenditure of these funds are largely separate processes performed by different people or groups, a convenient way of transferring funds from savers to users is necessary. While some people use their savings to buy real estate, durable goods, or corporate stock, most people use at least part of their savings to acquire debt assets of one kind or another. They may lend directly to other individuals or they may purchase government or business securities, but a large part of personal savings finds its way into productive investment through financial institutions. Since both individual savers and financial intermediaries show strong preferences for debt assets, people who need funds often find it easier and cheaper to acquire them by borrowing than by issuing capital stock. The growth in debt, therefore, is an essential part of economic growth, and a large part of savings is put to productive use through the lender-borrower channel. There are never enough savings to satisfy everyone who would like to use credit. The available supply is rationed through interest rates — the price of credit. With allowance for the differences in interest rates due to varying degrees of risk, increased competition for funds can raise interest rates beyond the levels that conservative borrowers will pay or inefficient producers can afford to pay (in the long run). This tends to direct savings and the real resources they can command into their most productive uses. The flow of savings and the way these funds return to the income stream through creation of debt are shown in the following diagram below. If any channel is cut off, future income is reduced. Debt does more than simply transfer idle funds to where they can be put to use — merely reshuffling existing funds in the form of credit. It also provides a means of creating entirely new funds — funds needed to finance the greater volume of new projects and spending that contribute to economic growth. Again, checkable deposits in commercial banks and savings institutions are debts — liabilities of these depository institutions to their depositors. But checkable deposits are also the money used for most expenditures. How do these deposit liabilities arise? Let us all be happy and live within our means, even if we have to borrow the money to do it. For an individual institution, they arise typically when a depositor brings in currency or checks drawn on other institutions. The depositor's balance rises, but the currency he or she holds or the deposits someone else holds are reduced a corresponding amount. The public's total money supply is not changed. But a depositor's balance also rises when the depository institution extends credit — either by granting a loan to or buying securities from the depositor. In exchange for the note or security, the lending or investing institution credits the depositor's account or gives a check that can be deposited at yet another depository institution. In this case, no one else loses a deposit. The total of currency and checkable deposits — the money supply — is increased. New money has been brought into existence by expansion of depository institution credit. Such newly created funds are in addition to funds that all financial institutions provide in their operations as intermediaries between savers and users of savings. But individual depository institutions cannot expand credit and create deposits without limit. Furthermore, most of the deposits they create are soon transferred to other institutions. A deposit created through lending is a debt that has to be paid on demand of the depositor, just the same as the debt arising from a customer's deposit of checks or currency in a bank. By writing checks, the borrower can spend the deposit acquired by borrowing. The recipients of these checks deposit them in their depository institutions. In turn, these checks are presented for payment to the institution on which they are drawn. As a result, the newly created deposit can be shifted out of the originating institution, but it remains part of the money supply until the debt is repaid. No effort is made here to give a detailed explanation of the creation of money through the expansion of deposits and depository institution credit. For present purposes, it is enough to point out that these institutions can make additional loans and investments, and thereby increase checkable deposit money, to the extent that they have the required amount of reserves against the increased deposits. The amount of reserves, in turn, is controlled by the Federal Reserve System — the central bank of the United States. 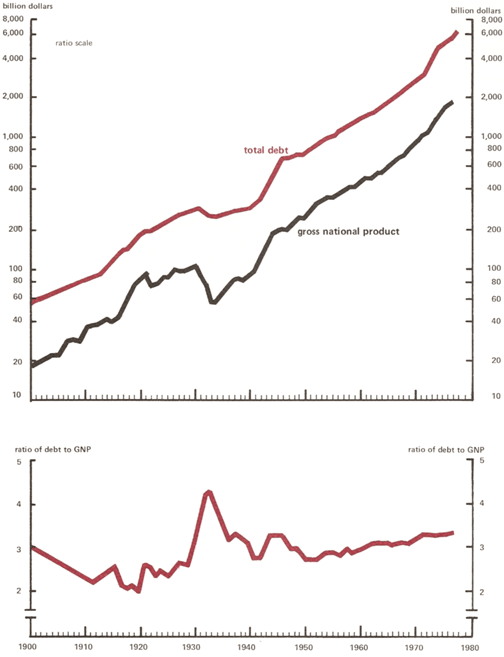 The chart below shows the general relationship between long-term trends in total debt and the value of the nation's production of goods and services, as measured by gross domestic product. These measures generally have moved upward since the turn of the century, but neither has grown steadily. Both debt and production have made major upswings in wartime, but the only period in which there was significant liquidation of debt was in the depressed 1930s. Debt and Economic Activity in the U.S.
People are generally more willing to incur debt — to buy houses and other big-ticket consumer goods — when incomes and employment are rising. And businesses find it more profitable to borrow when over-all income and expenditures are rising. The spending this new credit generates may, in turn, stimulate further increases in overall economic activity. But growth of debt is not always matched by general economic growth over short periods. Debt growth, in and of itself, does not generate economic growth, although it can be a contributing factor. In the decade ending in 1990, the dollar volume of debt rose 168 per-cent, compared with 104 percent for the total value of the goods and services produced. At the heart of our national finances is a simple, inescapable fact … that our government — any government — like individuals and families — cannot spend and continue to spend more than they take in without inviting disaster. Short-run differences in growth rates result partly from changes in interest rates and business expectations of such changes during the business cycle. Because interest rates tend to fall in times of slow activity and light demand for credit, some businesses plan to borrow funds for long-term expansion in such periods to get the benefit of lower interest costs. Even more important is the faster expansion of government debt in times when expenditures tend to rise and revenues fall. Although these factors hold down the cyclical variation in the volume of total debt, it is clear that growth of debt and growth of the economy are closely associated. With the aggregate indebtedness of the economy at more than $25 trillion, it is reassuring to note that this tremendous debt is not a single ever-growing account that will come due someday and be payable in a lump sum. Rather, it represents a snapshot at any one time capturing millions of individual debts in various stages of repayment. Any realistic appraisal of the problems of carrying this debt must take into account its rate of turnover, its distribution over the population, its relation to the total volume of business being carried on, and the flow of repayments compared with the incomes of debtors. And the purpose for incurring the debt must also be considered since debt that is used for investment can generate further income and impose less of a burden than debt used for immediate consumption. There are no statistics available to show the gross amount of lending and repayment transactions related to the aggregate amount of debt outstanding. Turnover — the ratio of repayments to total debt during a given period — is much higher, of course, for short-term debt than for long-term debt. Thus, turnover of consumer credit would be higher than that for home mortgage credit, and within consumer credit categories, turnover of revolving credit such as credit cards likely would be higher than for automobile credit. Home mortgages, which account for over two-thirds of all debt owed by households, are repaid, on average, in about seven and a half years, through regular amortization of mortgage loans, sales of homes, or refinancing. Relative to earnings, business debt is far larger than personal debt. It is also more evenly divided between long-term and short-term obligations. Moreover, about one-third of the short-term indebtedness of business represents trade payables, which are normally paid in a month or two and, therefore, turn over several times each year. Bank loans, which account for about another third, can stretch out over several years, especially when allowances are made for renewals, but many new bank loans to business are made for a few months at a time to carry inventory. Debt is being continually created and repaid in the government sector too. Governments, in addition to borrowing to cover the current excess of expenditures over revenues, replace maturing securities that are not being retired. Some government securities are payable after such short periods that they have to be refinanced several times a year. The total flow of credit from lenders to borrowers in a single year is very sizable, and the amount outstanding at any time represents the net accumulation of debt over the country’s entire history. Furthermore, as a result of sales of existing assets, real and financial, sizable shifts are always being made between debtors and holders of debt assets. Emphasis to this point has been on the economic functions performed by debt and the nature of debtor-creditor relationships. Does the important role of debt in the economy then justify discarding all the traditional aversion to incurring debt? If that question could be answered affirmatively, debt would present no real paradox. But debt's “other face” is not illusory: debt can be a source of difficulty. No nation ought to be without a debt. I wish it were possible to obtain an additional article to our Constitution … I mean an article taking from the federal government the power of borrowing. The desire of many people “to owe no man” probably stems largely from a reluctance to commit a part of future income in advance. There is always the possibility that a debtor's future income will not be enough to meet his or her financial needs, including repayment of debt and interest. This risk is very great in the minds of many people. But beyond their justifiable reluctance to assume fixed obligations in the face of an uncertain future, some people feel that any sort of indebtedness is a sign of living beyond one's means. On the other hand, there are people who borrow without hesitation and who purchase as much “on time” as their creditors will allow. Such people probably have very optimistic expectations of future income and a strong desire for current, as contrasted with future, consumption. Between these extremes are large numbers of individuals and businesses that incur debts easily within their ability to repay, with the expectation that by borrowing they will have greater satisfaction and/or earning power in the long run. They are witnesses to the economic fact that, when prudently undertaken, debt is not a sign of thriftlessness. Few would argue that all would-be homeowners should accumulate the full price of their homes in advance. By gradually increasing equity in a house through mortgage payments, a buyer often saves more than if the debt had not been incurred. As mentioned earlier, a person or business may borrow to finance purchases in preference to using savings held in the form of financial assets or in preference to paying rent for the use of others' property. Clearly, however, the amount of debt an individual or business can carry without risking future embarrassment, loss, or even bankruptcy may be less than some borrowers realize. For individual consumers in particular, the ease of obtaining credit has often led to repayment commitments hazardously large in relation to income and without enough allowance for emergencies. Trouble develops when the expectations of the borrower and the lender have been overly optimistic. A major source of confusion about the dangers of debt is the failure to distinguish between what people and businesses can do individually and what all consumers or all businesses, or even the whole economy, can do in the aggregate. While individual debts must be repaid, there is no dogmatic reason why the aggregate of all debts outstanding should be reduced. The composition of this aggregate is constantly changing. New debts are contracted and old ones repaid. As the economy grows and more savings are generated and more funds are required to finance new businesses and expand existing businesses, the total debt must be expected to rise. As has already been shown, savers and users of funds at any one time are to a substantial extent different people, and if savings are not used, the total flow of expenditures and income will tend to decline. The principal danger of overall growth in debt is that new money created through the expansion of depository institution credit will touch off price inflation by stimulating too much spending. Over time, a moderately rising money supply is usually consistent with a rising level of economic activity and full employment for a growing population. Some expansion in debt and money is necessary for the full use of resources and satisfactory economic growth. But when the economy is already working at capacity, or near that, additional money injected into the spending stream may simply drive prices up, setting the stage for subsequent recession and unemployment. The Federal Reserve System is responsible for providing enough reserves to support reasonable credit needs, but to avoid expansion at a rate that would cause price inflation and the subsequent economic problems. Cyclical variations in private expenditures and private debt are offset to some extent by concurrent changes in public debt — especially federal debt. In recessions, when the growth of private debt slows or declines, U.S. government debt usually rises, due partly to increased expenditures connected with programs to combat the recession and partly to reduced tax collections. Under such circumstances, increased public debt is not usually an inflationary threat, but rather a reflection of the weakness of demand in the private sector. However, when the U.S. government is already borrowing to finance large deficits, any additional borrowing can raise interest rates and further restrain economic recovery. In periods of prosperity, private debt tends to grow more rapidly. At such times, higher incomes can be expected to bring tax receipts more in line with government spending, thus reducing the rate of growth of government debt or reducing the need for further borrowing completely. When personal and business credit demands are especially strong, with private debt increasing rapidly and prices tending to rise, the government should operate with a surplus and reduce federal debt. Potential inflation then, not insolvency, is the principal danger associated with public debt. Given its extensive powers to tax and create money, the federal government can always meet its interest obligations, refinance maturing securities, and even, when consistent with overall economic objectives as well as social and political choices, reduce its level of total indebtedness. The burden of debt has been given a lot of attention through the years. Yet the nature of the debt burden is still not clear. People can think of their indebtedness as a twofold burden — the debt must be paid at maturity and interest charges must be paid on schedule. Repayment may turn out to be burdensome either because income falls short of expectations or because the product or service purchased with the borrowed funds is less rewarding than expected (which, of course, could be equally true of cash purchases). The uncertainty of whether the benefits will eventually outweigh the costs contributes heavily to the idea that debt involves a burden. What about the burden of the federal debt? As the economy grows, the total amount of public debt will probably continue to increase. Existing debt will be refinanced over and over again, and it will always be owned by those who want to hold government securities among their financial assets. The problem, therefore, centers largely on interest payments. But again, burden is hard to define. Small debts are like small shots; they rattle on every side and can scarcely be escaped without a wound, great debts are like cannon, of loud noise but little danger. It has been suggested that internally held public debt involves no net burden on the economy because “we owe it to ourselves.” Taxes collected to cover interest payments are equal to interest receipts of debt holders. However, an increasing amount of the public debt is held outside the U.S. And even if all public debt were held only by U.S. citizens and firms, all taxpayers are not receivers of interest in equal degree. Some hold government debt, some do not — although many hold it indirectly through financial intermediaries. Paying interest from tax receipts entails transfers of income that may have widely varying impacts on some people and institutions, while also affecting total expenditures and aggregate income in the economy, as well as the flows of income between national economies. Presumably, the benefits of any public expenditure are realized by the public as a whole, whether financed by current taxes or by debt. Whether taxes or interest costs are burdensome depends basically on the wisdom of the expenditures and any inflationary effects of the way they were financed. Present and future taxpayers may receive greater incomes if an increase in government debt has benefited business activity. They may be worse off, however, if government debt is increased to finance projects that waste real resources or if the debt is increased in a way that results in inflationary price increases. But the controversy over the burden of the debt has not yet produced precise answers about the impact of interest cost. Debt — public and private — is here to stay. It plays an essential role in economic processes. Which of its two faces appears predominant depends largely on the state of business conditions. If debt grows either too slowly or too rapidly, the consequences are bad. What is required is not the abolition of debt, but its prudent use and intelligent management.